One of our best sellers! The award winning wooden educational toy which you will want to keep. 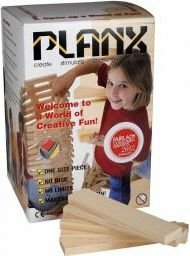 A great kit to get going on some bigger building... full colour illustrated box filled with 100 precision made Planx wooden building blocks. Double-sided instruction sheet is enclosed which covers basic building techniques such as alignment, balance, counterbalance and arches, right the way through to how to start building more complex structures. 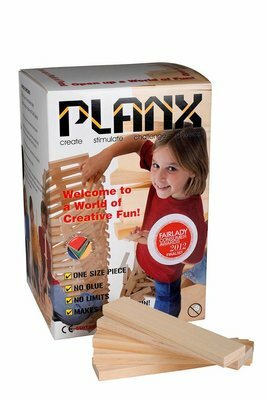 A Planx set stimulates creative play, and improves hand-eye co-ordination, dexterity and reasoning skills. Mum and Dad can join in too - no glue needed! A bigger set of 100 Planx allows you to build some larger creations. This award-winning educational wooden toy will improve hand-eye co-ordination, dexterity and reasoning skills and promotes creative play and stimulates the mind. No glue needed! This is a heritage' toy which the whole family can enjoy.